OLD BRIDGE — Seventeen-year-old Anthony Mazakas identifies as transmasculine, a person who was born female, but identifies with masculinity. His journey started when he was 14 years old and it is still evolving. “I had a boyfriend at the time, and for myself, I became increasingly jealous of his presence, his Adam’s apple and his physical appearance,” he said, adding it developed into an unhealthy relationship. 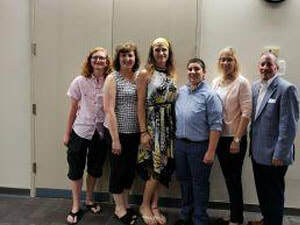 Anthony, his mother Michele Mazakas, Bobbie McArdle, Seth Rainess, Nate Longmore and Melissa Fehley participated as panelists discussing issues facing the transgender community from the process of transitioning to using public restrooms during a program at the Old Bridge Public Library on Aug. 9. The panelists shared their personal experiences and views and answered questions. Like Anthony, Longmore’s journey was similar. He was born a female, but identifies as male. With the support of family and friends, they both went through the process of changing their names and have had top surgery. “I came out as bisexual in 2015 when I was 16 years old,” Longmore said. At his high school graduation, Longmore, who is now 19, said it was a big moment when he was allowed to sit with the boys, explaining the girls and boys were separated by yellow and blue graduation gowns. McArdle said she found PFLAG — Parents, Families and Friends of Lesbians and Gays — after one of her children came out as a transgender. She is a facilitator with the Jersey Shore PFLAG chapter. Her son, who is 19 years old, was born a girl and transitioned into a male. His journey began in high school. McArdle said the organization helped her family understand the process. Since then, McArdle said her other child has come out as transgender. Her daughter was born a male and is in the process of transitioning into a female. “It’s a slow process,” she said. McArdle said for people who are not sure what a transgender person prefers to be called, he/she can ask the person for his/her preferred gender pronoun. Fehley, who is a male, shared her journey. Now he is a single parent of two teenage children; however, he once was married to his high school sweetheart. They had two children and essentially had the “white picket fence,” he said. He identifies as gender fluid and with help from a therapist is working on just being who he is as long as it is not hurting anyone. Mazakas said the Princeton PFLAG chapter was a Godsend to her family when Anthony first came out as transgender. “As a parent, it was overwhelming … it’s hard when you don’t know what to do and as a mother you need to know what to do,” she said, noting all her knowledge at the time with the topic of transgender was from television. Mazakas said Anthony’s pediatrician was familiar with the transgender process and led them to the Children’s Hospital of Philadelphia (CHOP). She said PFLAG helped educate her family and helped build a support system around Anthony and her family on his journey. Rainess, who is the transgender author of “Real Talk for Teens: A Jump-Start Guide to Gender Transitioning and Beyond” and a PFLAG Jersey Shore facilitator and board member, said transgender children are dealing with adult problems. He said it’s important as parents to develop a support system. He said from his experience, it’s the adults who fight the signs of whether their child is transgender or not. Rainess also serves on the advisory board of CHOP’s Gender Development and Sexuality Clinic. In addition, he is a member of the World Professional Association for Transgender Health and GLSEN (pronounced glisten), a national education organization dedicated to making schools safer for LGBTQ — lesbian, gay, bisexual, transgender and queer —students. The event was presented in part by the (PFLAG) Jersey Shore Chapter Speakers Bureau.